The Knitting Pirate » In Which the Pirate Shows Off. « In Which the Pirate Splurges. In Which the Pirate Shows Off. 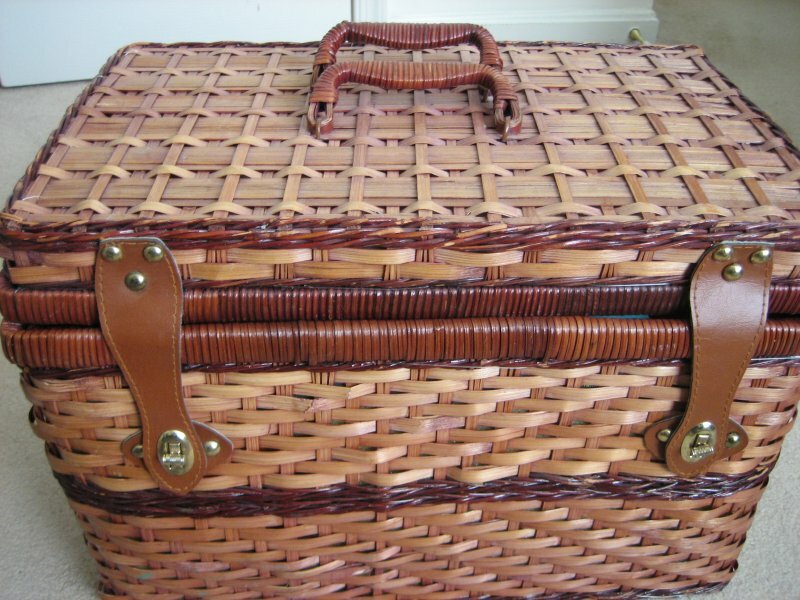 Let's take a tour of the basket! First, the top section with all the notions. 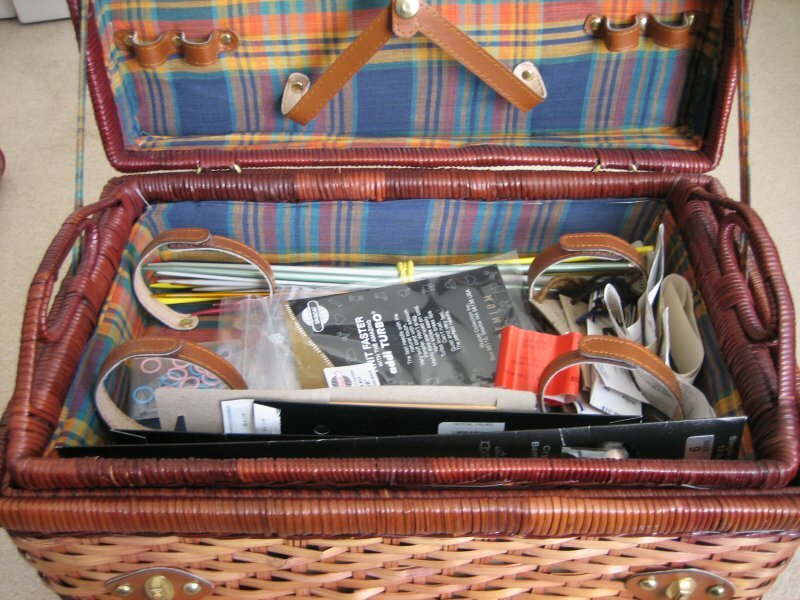 Needles, stitch markers, labels from all the yarn I've ever used... You can see that it used to be a picnic basket. This top section has spots for four cups. Plates and flatware went on top. But no more! Now it's yarn, all yarn! Muahaha! ...er. Okay then. 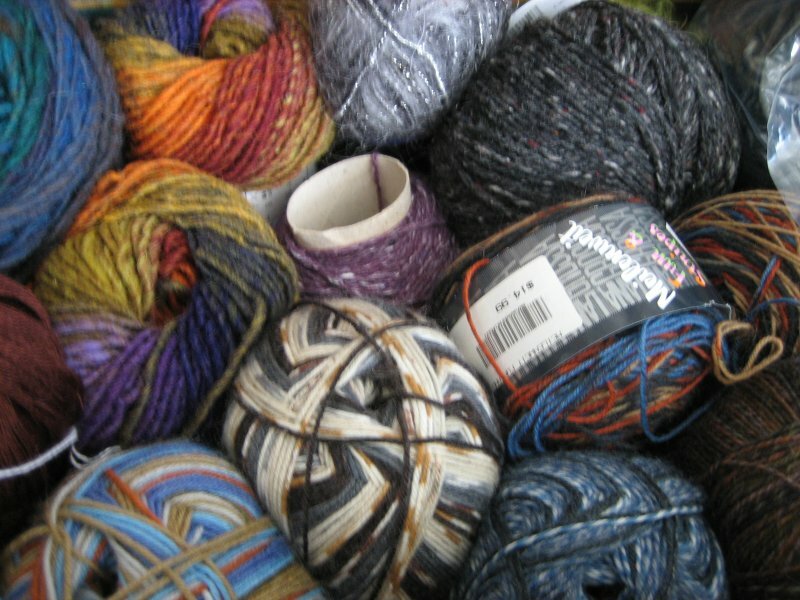 Sometimes I like to just look at the pile of yarn. All the colors and textures together make me happy. 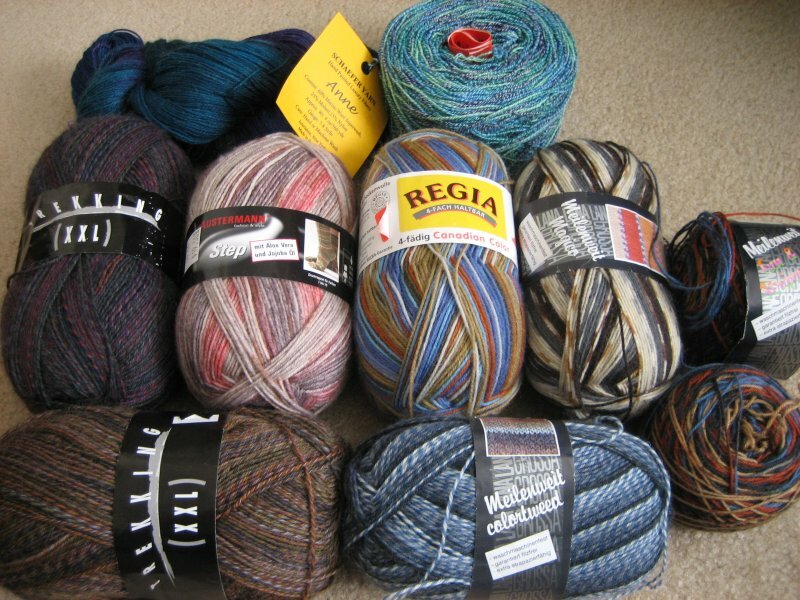 Especially that rainbowy Noro Kureyon! ...and sometimes I like to take out the sock yarn and imagine all the different kinds of socks that I will make with it. The pink and gray Austermann Step is the newest addition to the stash. Pirate-Husband and I enjoyed the beautiful weather over the weekend with a motorcycle ride. We went to a yarn store about 45 minutes away in Haymarket, a little town just where northern Virginia starts to become central Virginia. It's called Needles in the Haymarket, and everyone there was so friendly that I couldn't resist buying some yarn. They had a great selection of yarns there. Lots of alpaca, many many colors of Cascade 220, enough sock yarn that I had to force myself to choose. Even some Manos Cotton Stria, which I'd never seen before in person. It's considerably softer than I expected! Eventually, the Austermann Step won out because of the aloe content. 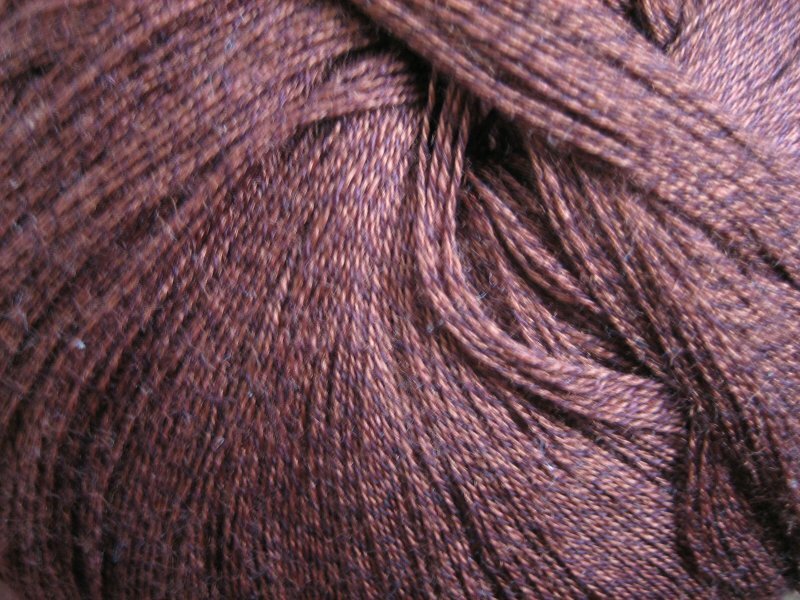 I got a bottle of Eucalan, too, which I'm sure will come in handy as I knit more things that can't be machine-washed. This is that silk and cashmere blend I keep talking about. It's so fine and perfect and soft, I admit I'm a little intimidated! But I have the pattern, and I have the yarn. All I need are the needles and the time, and this will be a gorgeous scarf. Granted, it's the kind of thing I don't usually wear, but I am looking forward to the challenge of knitting it. I have the thought that once it's done, I'll be so proud of it that it will be come the kind of thing I usually wear! Next thing you know, I'll be wearing shawls... what is this world coming to? Pomatomus is coming right along. I found my mistake - (Totally my mistake. Nothing wrong with the pattern. I knit the same round twice. Oops.) - and un-knit it, and now I'm going forwards again! Last night I got past the gusset decreases and decided to try it on... and it won't go over my heel. I'm not panicking yet. Maybe when I get further down the foot, it will fit better. Maybe it just needs some serious blocking. I am spot-on with gauge for the pattern, and I don't have particularly large ankles, so I don't know what's up. Am I in denial here, or is it reasonable to believe that I can make this thing fit? 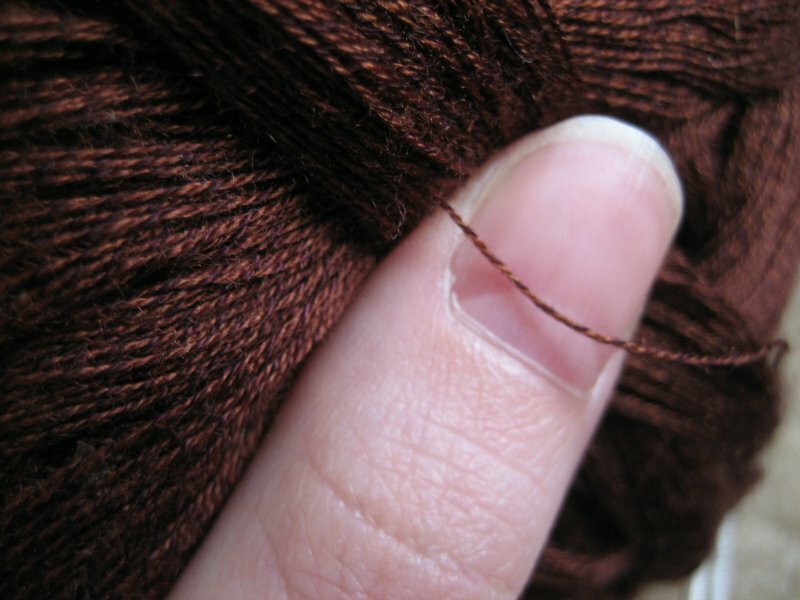 This entry was posted on Monday, April 23rd, 2007 at 09:57 and is filed under lace, LYS, meta-knitting, pomatomus, sock, stash. You can follow any responses to this entry through the RSS 2.0 feed. Both comments and pings are currently closed. Haven't re-started Monkey yet. I might do so tonight while watching Heroes season premiere.